The Bristol F.2 Fighter was a British two-seat biplane fighter and reconnaissance aircraft of the Frst World War flown by the Royal Flying Air Corps. 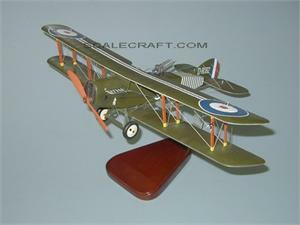 It is often simply called the Bristol Fighter or popularly the "Brisfit" or "Biff". Despite being a two-seater, the F.2B proved to be an agile aircraft that was able to hold its own against opposing single-seat fighters. Having overcome a disastrous start to its career, the F.2B's solid design ensured that it remained in military service into the 1930s, and surplus aircraft were popular in civil aviation. Mahogany wood. Scale: 1/20. Wingspan 20 inches, Length 13 1/2 inches.